The International Committee of the Red Cross says it has visited Muammar Qaddafi's son Seif al-Islam and he appears in good health. GENEVA (AP) — The International Committee of the Red Cross says it has visited Muammar Qaddafi's son Seif al-Islam and he appears in good health. A spokesman for the Geneva-based body says the visit took place Tuesday afternoon in the mountain town of Zintan, southwest of the capital. Seif al-Islam was captured Saturday. Red Cross spokesman Steven Anderson said the visit "took place in accordance with the ICRC's customary working procedures" and all further findings would remain confidential. The Red Cross has a long tradition of visiting detainees captured during conflicts to ensure they are treated in accordance with international law. Muammar Qaddafi died under mysterious circumstances shortly after his capture by opposition forces last month. TRIPOLI, Libya (AP) — The International Criminal Court's prosecutor said Tuesday that Libya can put Muammar Qaddafi's son and one-time heir apparent on trial at home, but that The Hague court's judges must be involved in the case. Luis Moreno-Ocampo was in Tripoli on Tuesday for talks with Libya's new leaders about their plans for Seif al-Islam Qaddafi, who was captured Saturday in southern Libya and is being held by fighters in the mountain town of Zintan, southwest of the capital. The ICC has charged him with crimes against humanity. Libya's new leaders have said they will try Seif al-Islam at home even though they have yet to set up a court system. "Seif is captured so we are here to ensure cooperation," Moreno-Ocampo told reporters after arriving in Libya. "If they (Libyans) prosecute the case, we will discuss with them how to inform the judges, and they can do it, but our judges have to be involved." The ICC, which is based in The Hague, Netherlands, has also charged Qaddafi's former intelligence chief, Abdullah al-Senoussi, with crimes against humanity. Libyan officials have said al-Senoussi was captured over the weekend and is being held in the southern city of Sabha, although Libya's interim prime minister could not confirm the report. Rights groups have called on Libya to hand both men over for trial in The Hague, and Moreno-Ocampo stressed that even if Libyans want to try the two men in Libya they must still cooperate with the world's first permanent war crimes tribunal. Libya is obliged by a Security Council resolution to work with the court, but that does not necessarily preclude a trial in Libya. If the National Transitional Council can convince judges in The Hague that the country has a functioning legal system that will give Seif al-Islam and al-Senoussi a fair trial on substantially the same charges as Moreno-Ocampo filed, then the ICC could declare Moreno-Ocampo's case inadmissible and turn it over to Libya. "The International Criminal Court acts when the national system cannot do it," Moreno-Ocampo said. "That's why we are here, to understand what they are doing." In a statement before his arrival, Moreno-Ocampo called the arrest of Seif al-Islam and al-Senoussi "a crucial step in bringing to justice those most responsible for crimes committed in Libya." Libya's new leaders have not yet established a functioning court system, and have been struggling to put together a new transitional government since Qaddafi's fall. Later Tuesday, interim Prime Minister Abdurrahim el-Keib was expected to announce the members of his new Cabinet. Seif al-Islam, who was once the face of reform in Libya and who led his father's drive to emerge from pariah status over the last decade, was captured Saturday by fighters from the small western mountain town of Zintan who had tracked him to the desert in the south of the country. He was then flown to Zintan, 85 miles (150 kilometers) southwest of Tripoli, where he remains in a secret location. 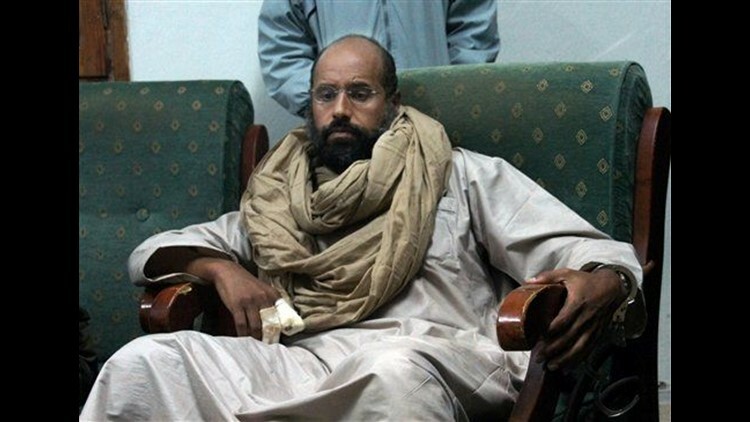 In new video footage taken the day of his capture and obtained by The Associated Press, Seif al-Islam warns his captors that Libya's regions that united to oust Qaddafi will turn against each other "in a couple of months or maximum one year," suggesting the country will descend into infighting. There have been signs in recent months of growing tensions among Libya's powerful regions, and even after Qaddafi's fall in August and after his capture and killing in October, the country's numerous and sometime competing revolutionary factions have refused to disarm, raising fears of new violence and instability. The regions, backed by bands of armed fighters, are able to act autonomously, even on issues of the highest national interest.